Death by Grammar: The Boy Kanin experience. In collaboration with Boy Kanin, thoughts and opinion are my own. Kanin Get It! You can now start enjoying more of Boy Sisig, Sizzling Liempo and Chicken Pinoy Barbecue to your heart’s content with unlimited rice! Whether you’re out on a diet cheat, on a food binge with your friends and family, or you just want to enjoy a full serving of rice meal, Boy Kanin got you covered. I am still so full! I just had a serving of generous amount of 1 cup of rice and juicy meaty barbecued Chicken, Sizzling Liempo and Boy Sisig in one sitting! So I went to a fun event tonight with one of my dear friends, and she was right when she said that if I’m looking for a new food place to hang-out with family and friends, Boy Kanin is the place. I couldn’t immediately get up from my seat when it was time to go because I really enjoyed my meal and I felt bloated, especially when they served us the Boy Suman with the sweet coco jam and latik, I think I died and gone to food heaven when I had my hands on the Boy Suman sa Latik. I basically grew up with this glutinous rice cake which we usually have during snack time, commonly after nap time in the afternoon, my grandmother used to scold me whenever I’d pour a generous amount of coco jam and latik on my suman because sugar may make my teeth weak and sugar rush and me don’t mix well together, haha! I’d still do it anyway. I’m just so glad they thought of adding Boy Suman on their menu because this is one of my comfort food. Will definitely come back for this! Chicken Pinoy Barbecue: Among Boy Kanin’s menu, Chicken Pinoy Barbecue is one of their newest additions which I really liked because even though grilled, the meat is still tender and juicy; it’s not too charred and doesn’t taste like burnt wood, you can still find a little crunch to the bite there, which means that they take a lot of care in preparation and cooking of food. You can go with catsup for sauce or dip, but I enjoyed Chicken Pinoy Barbecue with their specially fermented vinegar. Sizzling Liempo: Speaking of specially fermented vinegar, this concoction is basically paired with their Boy Kanin Sizzling Liempo, the way this food is prepared is not too greasy, and it has a rich taste that’s not overwhelmingly tangy, which means your taste buds will not be sated, especially when dipped in their specially fermented vinegar, you may find yourself ordering for another round. 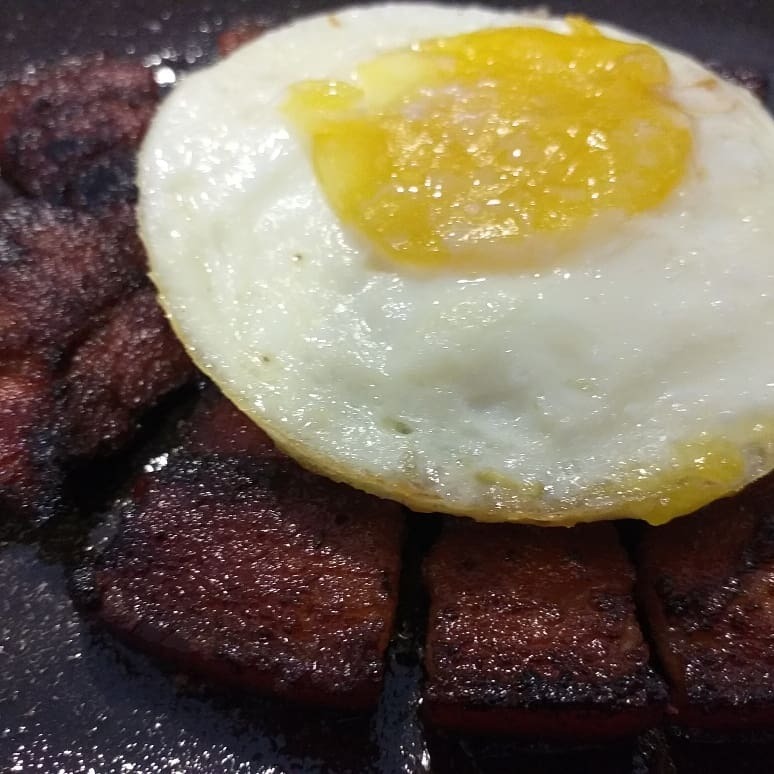 Boy Sisig: What’s a pinoy meal with the infamous sisig? Boy Sisig is unlike the usual that I’ve tasted because it doesn’t overwhelm the palate with too much grease, so it’s not messy to eat. The combination of the sisig’s rich flavor and crunch will definitely make you want more rice to pair it with, so while you’re at it, looking for your sisig fix and unlimited rice, Boy Kanin got you covered! 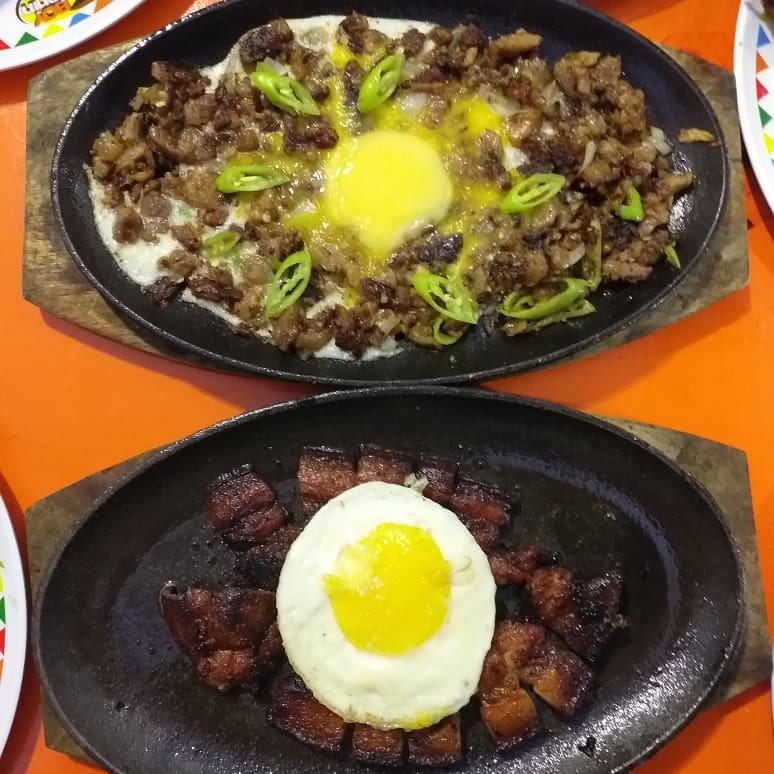 The sisig is a combination of both meat and pork, so you’re getting the real deal, unlike the ones I’ve tasted that seems like it was a smorgasbord of discarded scraps. 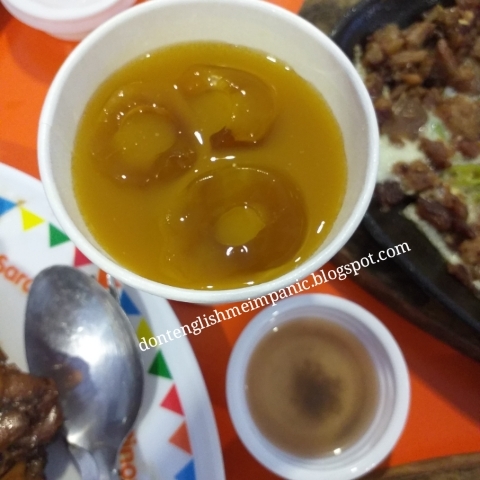 Boy Kanin Salabat: One of the things I like about Boy Kanin is that, they also serve a non-carbonated drink, the ginger juice with a twist. There’s something about the taste that I can’t put my finger on, but it’s definitely rich, and refreshing. This is definitely great for those of you who need to cut down on carbonated beverages, cold ginger brew tea is definitely a good option because it’s not just healthy for you, it also improves digestion and food absorption. Apart from that, Ginger brew tea is a good palate wash from food grease. Trivia: Boy Kanin ginger brew tea is sourced from the Aetas who grow them, so for every order of the Boy Kanin Salabat, you are also helping out our local farmers. 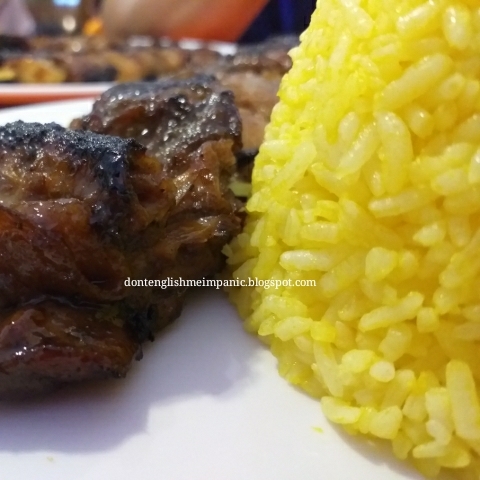 Boy Kanin Pork Barbecue: Dubbed as the pinoy staple in every occasion, Boy Kanin is not far behind. Tasty, juicy and not too greasy, you can’t resist but pair it up with a cup of steamed rice. 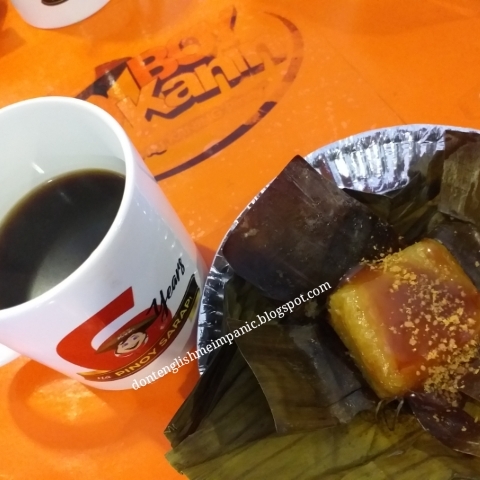 Boy Suman sa Latik & Kapeng Barako: Suman and Kapeng Barako are just two of the Pinoy comfort food and a staple in every Filipino table especially for breakfast or an afternoon snack. Both are very good for palate wash to break from the meat grease. One serving includes two small blocks of suman with a small pack of coco jam & latik, paired with Kapeng Barako. This part of the event, I think is my favorite, I got myself salivating while I carefully spread the right amount of the coconut jam and sprinkle on top of the glutinous rice, while I examine the bite I was about to take. Heaven! 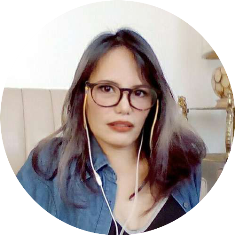 Filipinos not only enjoy good company, we also look for affordable prices and an awesome service with a smile. The ambience of the place is perfect for people who want to experience good food, the company of dear friends and people, the venue and the fun that comes with everything. 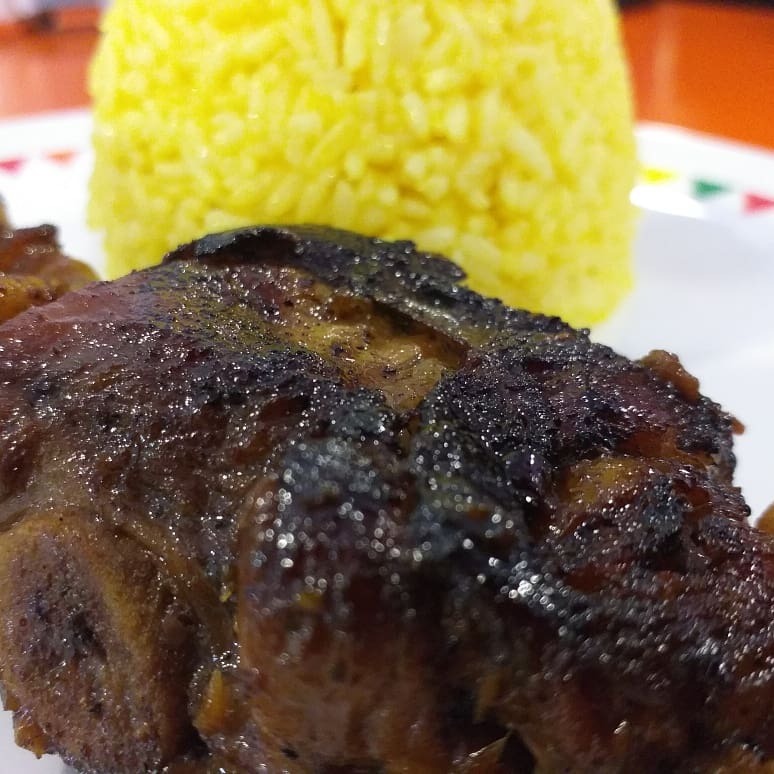 Boy Kanin seeks to do just that; cater not only to the Filipino taste buds but extend the over-all experience of the local Pinoy lifestyle to everyone. 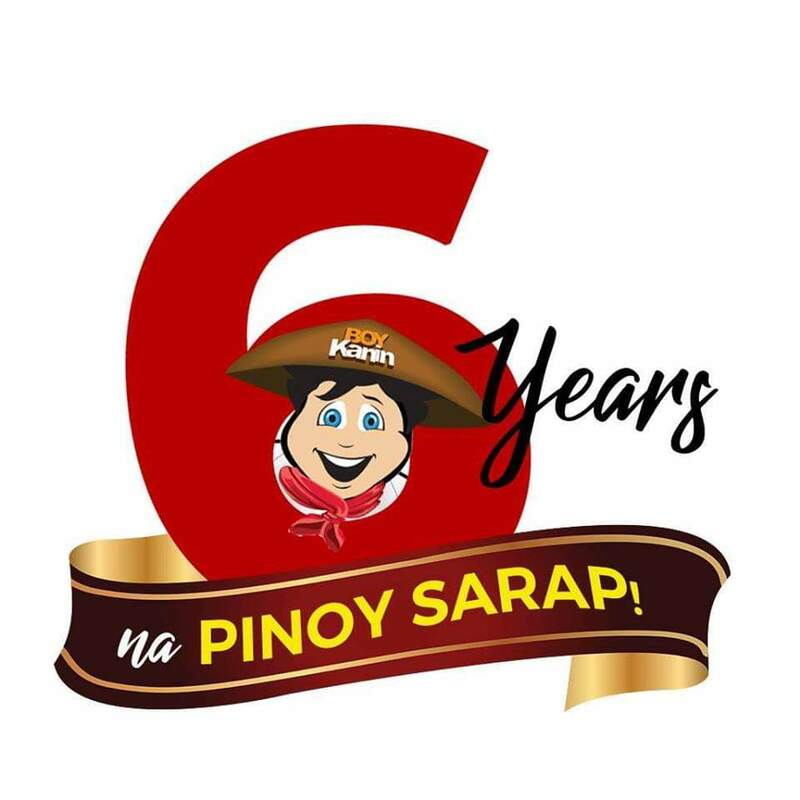 Background: Dubbed as the "Filipino’s favorite kaninderya", Boy Kanin is celebrating its 6th year in the food industry. Aside from the budget-friendly meals they offer, they also gave an upraised definition to the usual local hole-in-the-wall eatery we’re used to; clean food, clean store, and the menu is carefully picked by the founder himself. By offering authentic Filipino cuisine in a menu that is also comfort food to majority of the Pinoy populace, on a more modernistic approach, every Juan & Juana will surely love going back for more of what Boy Kanin will offer. It’s no wonder the business stayed strong and thriving in the span of six years being in the food business, they simply defined loving our own.